Ihar Komlik (left) and Henadz Fiadynich (right). Photo credit: Солидарность (Solidarity). 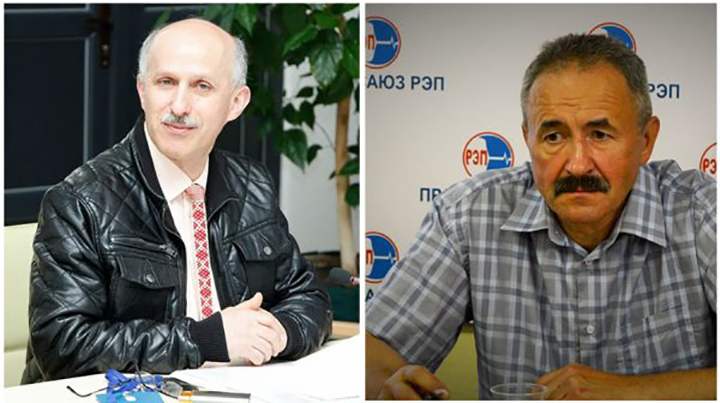 Civil Rights Defenders is very concerned about recent developments in the criminal case against two Belarusian trade union leaders. The sentence – which is clearly politically motivated – was announced on 24 August, and the two men were found guilty of large-scale tax evasion. Henadz Fiadynich, chairperson of the Belarusian Independent Trade Union of Radio Electronic Industry Workers (REP), and Ihar Komlik, the Union’s accountant have been found guilty of committing a crime under Part 2, Art. 243 of the Criminal Code – large-scale tax evasion. They were presented with the charges in May this year and have now been sentenced to four years of restricted freedom and are not eligible to hold official posts for a period of five years. The charges were clearly politically motivated, and the sentence is by all appearances a way for the authorities to intimidate civil society organisations in the country. Several local human rights organisations have released statements condemning the sentence. Civil Rights Defenders believes that the sentence is an attack against the civil society at large, and the two Trade Union Leaders in particular. A similar case was brought forward by the Belarusian authorities in 2011, targeting the 2014 recipient of the Civil Rights Defender of the Year Award, Ales Bialiatski. Civil Rights Defenders calls on the authorities to reverse the sentence, as well as to drop all criminal charges against the two trade union leaders. We further urge the authorities to stop harassing the trade union movement and the country’s civil society. To live up to its obligations in accordance with international human rights standards, Belarus must refrain from all future illegal interference in their activities.